You are here: Virgin Islands News Online » News » Almost 1 month later smoke still active @ Cox Heath dump site! Almost 1 month later smoke still active @ Cox Heath dump site! 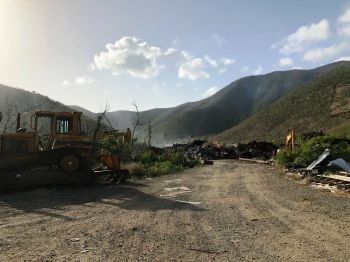 COX HEATH, Tortola, VI - Residents are concerned that a fire that erupted on May 9, 2018 - almost a month ago - at a temporary dumpsite in Cox Heath, on the western side of Tortola is still burning. There has been mixed information coming from Government Officials as to when the fire and smoke will be put out. Days after the blaze and smoke started, Zebalon A. McLean, the Chief Fire Officer said the conflagration should be extinguished in two weeks. As of today June 3, 2018, the fire and smoke continues—almost 4 weeks later. Mr McLean had changed his response late last week and said he could not tell when the fire will be extinguished or how it was started. On Friday, May 25, 2018, Minister for Communications and Works, Hon Mark H. Vanterpool (R4) and Leader of the Opposition, Hon Andrew A. Fahie (R1), made a joint site visit, with a promise that in 7 days the fire will be out. It has since been 9 days, and still, the smoke and fire continue. The western side of Tortola is most affected as many residents had to be evacuated from their homes. Residents on neighbouring St Thomas and St John in the United States (US) Virgin Islands have also complained of the effects of the smoke reaching their homes and businesses. 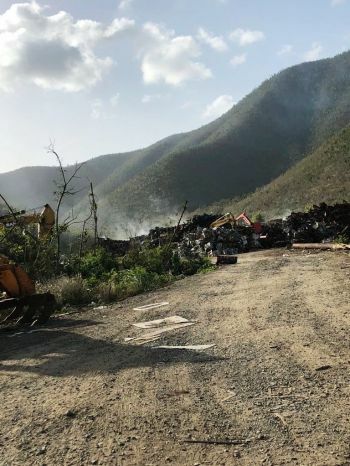 Health and Social Development Minister, Hon Ronnie W. Skelton (AL)—under whose portfolio falls Waste Management, the agency responsible for the temporary dump site—has been silent on the fire and issues surrounding it. Yes, smoke really does appear like magic from thin air. Wow, obviously you live in the West and inhaled too much of it. Is this an indirect way of enacting genocide on us? Who should be held responsible? This is not good at all; my 3 children have been experiencing dry cough and I’m am just hoping that there will not be any long-term affects on their health and neurological (learning) abilities. NDP has really failed we. If they didn’t wasted soo much of our money, they could have correct this in a more timely and aggressive manner. These toxins will linger in the atmosphere for some time. We really need to equip our Fire Department properly. This is ridiculous. Have some type of foam that can be used to help with the process of putting out the active smoke? I know it is going to add another expense to people's pocket but, try and get a air purifier to help clean the air in your home especially if you have children. I have one and 3 weeks in, it was a waste of funds and time. How is a home air humidifier going to purify the air when this smoke was in people's homes like they were under intense fogging for weeks. Even masks were not helpful. Some people always have the answer except when the shoe is on their foot. @Please stop. Air purifiers and Humidifiers works different.Air purifiers clean indoor air and remove dust and smoke from indoor air. Humidifiers are used if you have a cold and is congested. Big difference right? You have a good day. Pageing the Minister responsible....where are you dude? Silence is golden!!! ActionMan wha you saying? The AL-reps...Archie what’s the word down their son...? Quiet on all fronts.....priceless!